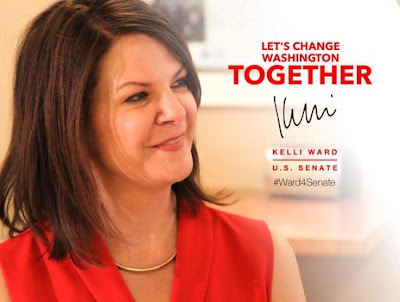 Kelli Ward, a conservative state legislator and physician challenging five-term senator John McCain in the Republican primary, has little statewide name recognition — but McCain is so unpopular she is nevertheless virtually tied with him in polls. She has her work cut out for her though. McCain is spending millions to defeat her, and stooping to misleading attack ads to get the job done. I should note that I served as the director of social media on J. D. Hayworth’s unsuccessful campaign challenging McCain in 2010, and experienced McCain campaign attacks firsthand. My experience, and what Ward is enduring now, apparently are not out of the ordinary. A couple of prominent Arizona politicians have told me they do not dare run against him because they do not want to put themselves and their families through the inevitable smears. The McCain campaign bought a barrage of ads in late May associating Ward with the chemtrails conspiracy theory, the unproven notion that there “are long-lasting trails left in the sky by high-flying aircraft consisting of chemical or biological agents deliberately sprayed for sinister purposes undisclosed to the general public.” McCain’s campaign, using a technique called ad remarketing, got the “Chemtrail Kelli” ads to pop up all over the internet, accusing her of being a conspiracy theorist and insisting she spent tax dollars entertaining chemtrails theories.